THIS YEAR MARKS THE 10TH ANNIVERSARY season of Sierra Stages, an award-winning community theatre group in western Nevada County that has helped shape the area’s designation as a statewide cultural district. The 10th anniversary season includes two musicals and one classic American comedy: The zany and heartbreaking musical “A New Brain” by William Finn and James Lapine, the enchanting new musical version of Roald Dahl’s “James and the Giant Peach” by Timothy Allen McDonald and the songwriting team of Ben Pasek and Justin Paul; and the classic and enduring American stage comedy “You Can’t Take It With You” by Moss Hart and George Kaufman. For the first time, all three shows presented by Sierra Stages are at the historic Nevada Theatre in Nevada City and all seating is reserved seating. The 2018 season opens with “A New Brain,” an engaging and fast-paced musical based on the actual life experience of composer William Finn. When a frustrated children’s television composer is struck with a rare brain disorder he faces the possibility of his own mortality. The tumultuous, comical and surreal ordeal that engulfs him and those closest to him—his mother, partner and publicist— teaches everyone something profound about what is truly important in life and in love. “A New Brain” plays from March 1–17. “A New Brain” is directed by Robert Rossman and Jailyn Tafolla, with music direction by Ken Getz, and it features local actors Brian Arsenault, Jay Barker, Heidi Grass, Jonathan Hansard, Michaela King, Sue Legate-Halford, Heather Lucas-Ross, Kevin Lucas-Ross, Ken Miele, and Sara Noah. The set design is by Robert Rossman, lighting design is by Erin Beatie and Hunter Schott, and costume design is by Paulette Sand-Gilbert. 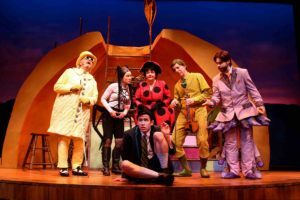 From July 12 through August 4, Sierra Stages presents “James and the Giant Peach”, a new musical guaranteed to mesmerize theatregoers of all ages. In this compelling story by beloved author Roald Dahl (Charlie and the Chocolate Factory, Matilda), a young orphan named James accidentally drops magic crystals by an old peach tree and strange things start to happen. James soon discovers a world of magic and adventure full of friendly insects and learns that love and family can be found in unexpected places. Robert Rossman directs, with music direction by Ken Getz. “We were all immediately taken by the score for ‘James and the Giant Peach’ when we first heard it, and the story by Roald Dahl is an absolute winner that speaks to children, teens, and adults,” says Sierra Stages managing director Peter Mason. To close out the season, Sierra Stages presents “You Can’t Take It With You,” a classic American stage comedy that deftly blends elements of farce, slapstick, whimsical humor, social commentary, and romance, together with a generous dash of good-na- tured optimism about the human condition. “You Can’t Take It With You” plays Septem- ber 20-October 6, 2018. Scott Gilbert directs. Sierra Stages also invites everyone to become a Sierra Stages member with a tax-deductible donation that supports quality local theatre. 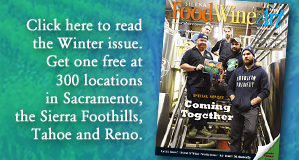 Season passes may be purchased now through March 1 online at SierraStages.org or by calling Sierra Stages at 530-346-3210.